In these hi-tech days of Xbox’s, iPad’s and laptops it is all too easy for children to spend the majority of their free time indoors and glued to an electronic device of some sort. While there are clearly benefits of children being accustomed to using the hi-tech tools of the 21st century, it is equally important not to ignore the huge importance of good old-fashioned outdoor play. Play England is a great charity which is spreading the word that play is crucial for kids and should be promoted and encouraged wherever possible. Click here to see why play is so important. We couldn’t agree more and that is why we have been designing, selling and building top quality wooden outdoor toys for over 22 years. One of the best ways to encourage outdoor play and see the benefits that come with it is by installing a wooden climbing frame in your garden. Then there’s no need for a family excursion to the park trying to keep yourself warm while supervising them amongst the crowds of kids of all ages and abilities – just open the back door and leave them to it while you keep an eye on them from the warmth of your own kitchen! Basically, to get the real long term benefits of outdoor play it needs to be easily accessible. 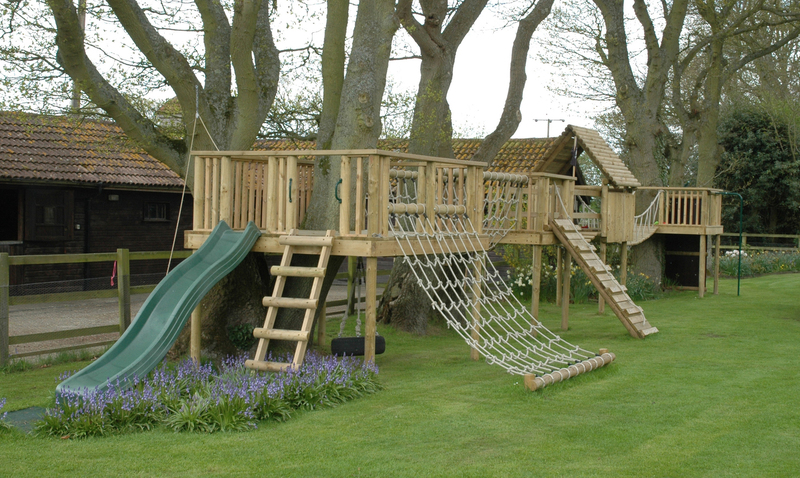 With a wide range of wooden climbing frames to choose from, we have something to suit all sizes of garden and budget. 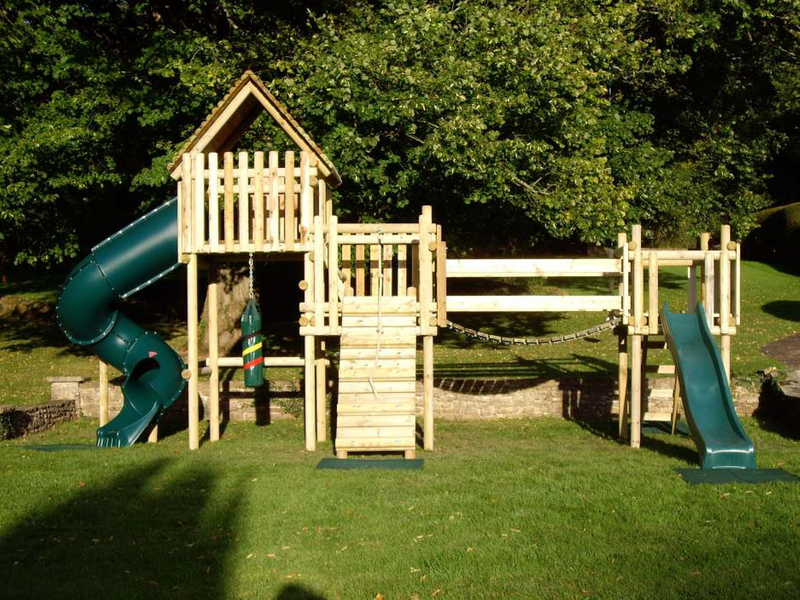 From a compact wooden play tower to a large bespoke designed wooden play structure we can supply it all and, if the building and installation isn’t for you, we can do that too. Wooden climbing frames have increased hugely in popularity over the last decade as the designs and materials have improved resulting in very aesthetically pleasing and durable play structures which can cater for the needs of a wide age range. The Active Toy Co is the exclusive importer of Houtland climbing frames, a well-known European brand of good quality and reasonably priced wooden climbing frames and swings which all sit at ground level and are suitable for children aged up to 12-13 yrs old. We also sell TP Climbing frames which offer 2 main designs – the Castlewood and the Kingswood – and also sit at ground level and suit ages up to 12 – 13. The Castlewood is ideal for the smaller gardens as it has a very compact footprint whilst still offering lots of play value and will blend nicely into all gardens. The Kingswood is a larger structure with more play space and higher platforms which will certainly keep the older children entertained. 1. 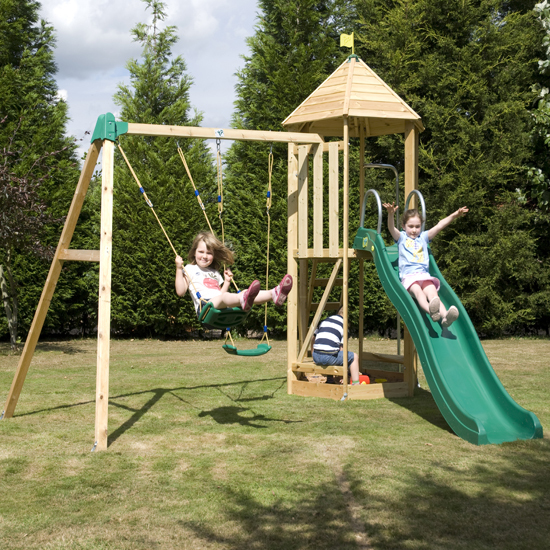 Packages – we have several pre-configured packages which consist of the most popular combinations of elements, for example the Langley Play Fort and Double Swing Arm. Quick and easy to order. 2. DIY design – the customer chooses a number of different elements and, with design advice from us, comes up with a layout that suits them. A bit more involved but very flexible. 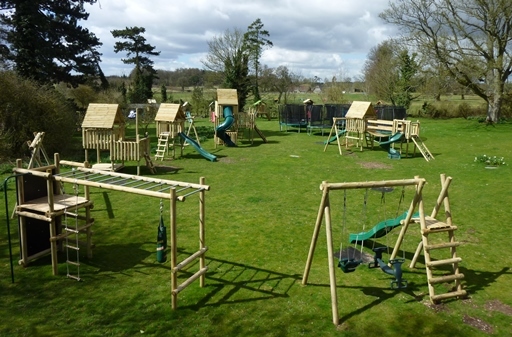 Bespoke design – following a site visit and a brief from the customer we design and construct a unique play structure to suit the site and customer requirements. The possibilities are endless! All Langley Climbing frames are concreted into the ground to provide considerable stability while also improving the aesthetics (fewer ugly support braces etc!). Using pressure treated top quality timber and a wide range of accessories we have all the tools (literally!) 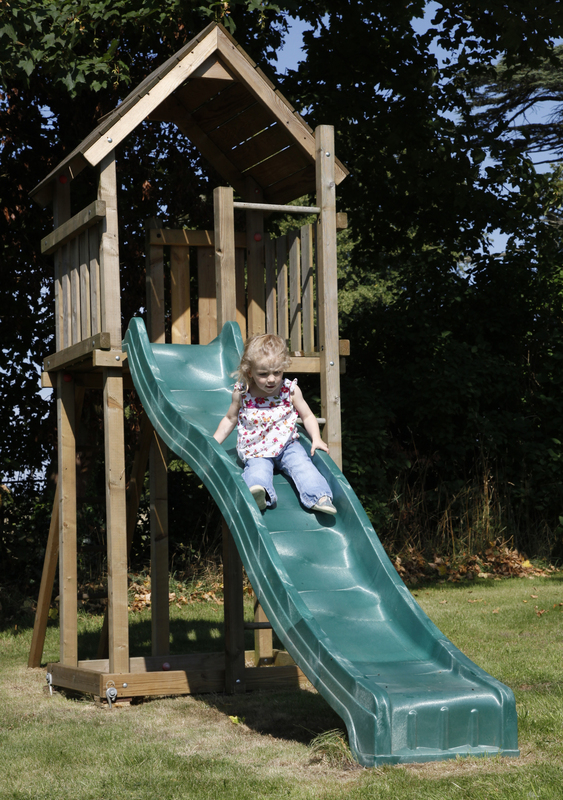 to supply a wooden climbing frame for all situations. The best way to appreciate the differences between these climbing frames is by seeing them in the flesh and letting the kids try them all out. That’s why we are one of the few companies left offering a full ‘try before you buy’ opportunity at our shop and display site on our farm near Newbury where you can let the kids loose and see what they get the most out of whilst picking our brains on the pros and cons of each climbing frame. If you can’t make it to us, we can arrange a site visit to see your garden and discuss options and we can offer lots of help and advice over the phone – we have many years of experience at hand to make sure you choose the right climbing frame for your garden! A recent email testimonial from one of happy customers says it all! “After some research, we decided to go with Active Toy Company for a climbing frame for our young children. It turned out to be absolutely the right choice. From our initial visit through to our purchase and installation, they provided an exceptionally high quality, professional and friendly service. Perhaps because it’s family-run, they seem to make it their business to understand what you are looking for and how you can make it work best for your children within your budget. Our kids love their play equipment and are out in the garden for hours on end. We could not recommend them highly enough!” Mr and Mrs P, Crowthorne, Berkshire. So, go to our website, visit our shop and display or give us a call on 01635 248683 to discuss your wooden climbing frame requirements and soon the kids will ditch the Xbox or iPad and will be playing outdoors instead!